This gateau could be the centerpiece of any celebration. 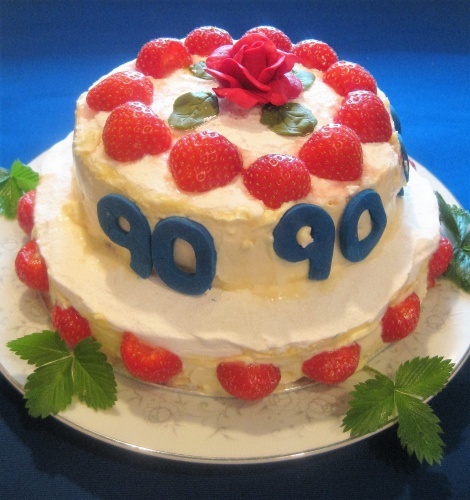 Made to celebrate the Queen’s 90th Birthday. I have designed it in the shape of her favorite style of hat, decorated in red, white and blue with blue numerals around the side of the top cake. The combination of meringue, strawberries and cream is hard to beat. Both the meringue discs and the numerals can be made in advance. The cutter for the numbers and the blue colouring are obtainable from Lakeland. It must be assembled on the day otherwise the meringue will soften. There are two sections, the top is smaller than the base in order to give the hat shape. You will need two baking trays and non-stick baking parchment. It’s an advantage to have a thin cake card (8”/20cm) to put the cake on. Combine the two sugars. Whisk the egg white until stiff. Whisk in half the sugars very gradually a little at a time, then using a large metal spoon fold in the reminder with the lemon juice and cornflour. Dab a touch of meringue under the paper rounds to keep them in position. Divide the meringue between two rounds and spread as evenly and level as possible up to the edge, keeping the perfect shape. Bake until completely dried out. This will take at least 1½ hours at a very cool temperature. The cooler the temperature the whiter the meringue will remain. When they are ready you will be able to lift them easily from the paper and there will be no softness underneath. They must be completely dry. Store in an air tight container with baking parchment between them. Cut out three 6”/15cm circles of baking parchment. Now repeat the method of making the meringue using the three rounds of paper. Bake until perfectly dry, store if necessary. Larger base: Cut 8 strawberries in halves and reserve for decoration. Slice the remainder. Very lightly whip the cream, mix half into the sliced strawberries and spread onto one of the rounds. Place the second on top and spread the remaining cream evenly around the cream, filling any gaps. Position the halved strawberries on the cream. Dredge the top heavily with icing sugar. Smaller top: Cut 6 strawberries in halves and reserve for the top. Slice the reminder quite small. Very lightly whip the cream mix halve with the sliced strawberries and sandwich the three rounds together. Spread the remaining cream around the outside filling any gaps. Dredge the top heavily with icing sugar. Put the top section onto the base and place the numerals around the side. Position the halved strawberries on the top around the outside edge. NOTE Measure the egg white and sugars very carefully for the meringue.